I am writing this short inroductory note in my capacity as an educator who has been involved in the field of music for some 40 years with the establishment of the musical institution "C. Merulo" of Castelnovo ne' Monti (near Reggio Emilia, Italy). Having reached retirement age, I was struck by a thought of pedagogical nature regarding my long years of experience, considering how important the role of the teacher is in relation to a student, who demostrates a marked natural talent on the level of performing, and understanding of his musical interests. 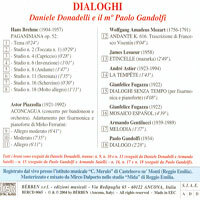 In presenting this CD, I wanted to focus on the study program of the young Daniele Donadelli, a student I taught for fully eight years, up until the completion of his mid-level exams: he has now graduated with top honors under the tutorship of Prof. Mirko Ferrarini (who took over my position). The CD program starts with a series of studies from op. 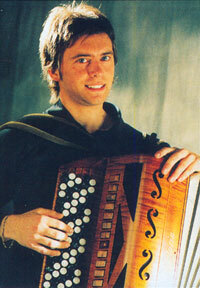 52 "Paganiniana" by H. Brehme, the concert "Aconcagua" by A. Piazzolla (for bandoneon and orchestra) and an "Andante" by W. A. Mozart: these pieces constitute an integral part of the examination program for obtaining the state diploma. Then we find the pieces like "La tenpete" by A. Astier and "Enticelle" by J. Lesuer, which are part of the French "variete". 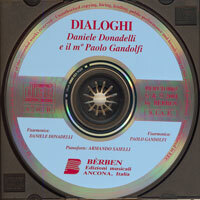 In these performances Daniele demonstrates his spontaneity in the South-American music, as well as in the "variete", in which one notes a distinct creative disposition. 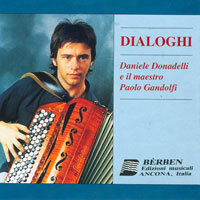 My participation as a veteran accordionist in the following pieces is intended - like a "dialogue" between two generations - as a suport for the young Daniele, like an encouragement for his promising career. 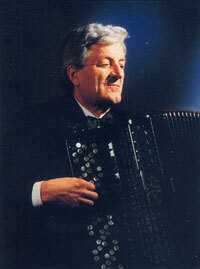 Revisiting my accordion experiences of the '50s, here is the glorious "Mosaico Espanol" by G. Fugazza, followed by the recent "Dialoghi senza tempo" (for accordion and piano) by the same composer. The two final pieces, "Melodia" by A.Gentilucci and "Dialogo" by myself, are two simple songs without accompaniment, which can also be played by a string or wind instrument: they constitute a testimony to the profound friendship I enjoyed with the composer Armando Gentilucci. In the melody (dedicated to me) the first notes represent my name (Paolo), while the "Dialogo" (my response to Gentilucci) retraces the same criteria of thought.